New teachers have so much to juggle: designing engaging lessons, learning new content, managing a classroom, fielding questions from concerned parents, grading the inevitable volume of papers—the list goes on and on. In the back of new teachers’ minds is the lingering question: What exactly should I be spending my time on? We’d like to offer some guiding principles to help new teachers remain grounded and focused while also building confidence and professional capacity. Your classroom should move to a predictable rhythm. Students should know what’s expected of them and abide by those expectations. You should have strategies to settle the class down and quickly get their attention. Your eyes and body language should correct minor behavioral issues as you facilitate discussions, answer questions, guide students through activities, and offer feedback. These are not easy things to master. Yet they are worth mastering: A well-run classroom inspires your students’ respect and trust and enables you to teach rigorous, engaging lessons. Students should know what they’re learning—and, more importantly, why they’re learning it. When you plan your lessons, write clear objectives and establish a coherent learning path. The learning goals should then inform everything from the desk arrangement and technology tools utilized to the activities selected. All of this must seem daunting, but new teachers can offer students a unique energy and infectious enthusiasm about their subject matter. The power of this cannot be underestimated. Share with them how your passions extend beyond the school day: Are you an English teacher who’s also a writer? Are you a science teacher who keeps reptiles as pets? Are you a history teacher who’s active in local politics? When you bring these identities and experiences to your classroom, you build relationships with your students while reinforcing your authority. Our students need to know that we care about them and their ability to succeed. Ask them about their lives and their interests. Share their excitement about their soccer team’s win and their disappointment with their math grade. Help your struggling students to improve by offering second chances, redos, and rewrites. School and life are about learning, not about getting it right the first time, or at the same time as other people. You also need to challenge your high achievers, by offering opportunities to research, create, and write about topics that interest them—even topics outside your planned curriculum. Excellent teachers partner with students in the learning process. Get out from behind your desk and sit in a circle with your students. Pull up a chair to join their groups. Offer them the front of the room while you sit in the back and listen. Inviting students’ voices into conversations enables you to seamlessly shift roles from director to co-learner. Sometimes you’ll be modeling the writing process, and other times you’ll be writing a reflection alongside your students. One day you may be reviewing the norms for civil discourse—and soon after become an equal participant in the discussion. Students need to know that you’re learning with them and that you’ve got their backs. Although new teachers may feel reluctant to ask their colleagues for help, doing so demonstrates that you respect the person you’re asking. You’re not seeking handouts and materials but tapping the expertise of colleagues to improve your practice. To learn some of the more subtle moves of effective teachers, ask to observe your colleagues in their classrooms. Notice how they transition between activities, how they relate to students, and how they respond to questions and concerns. Consider what feels right to you, and decide how you can incorporate these strategies into your own practice. Keep in mind that great feedback doesn’t come solely from colleagues and administrators—often it comes from students. Throughout the year, ask students to share their experiences of being in your classroom. For guidance on how to solicit helpful feedback, try Pernille Ripp’s 30-day reflection (pdf). 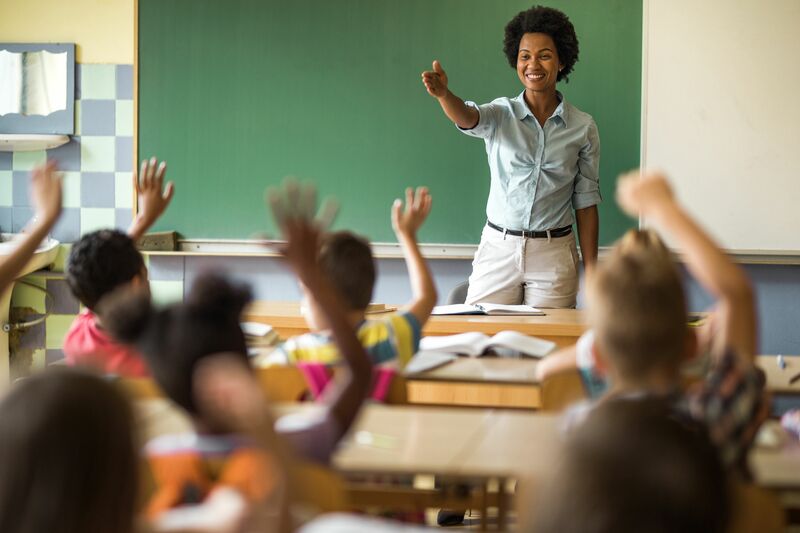 You cannot underestimate your value as a teacher: Educational research consistently shows that good teachers strongly influence academic outcomes. Over time you’ll develop a teaching style that reflects your personality and core beliefs. None of us have all of the answers, yet all of us want to be the best teachers we can possibly be.